Fact.MR shows that expansion and improvements in road infrastructure are the prime fillips responsible for asphalt paver sales in the construction equipment market. Airport paving projects are other prominent consumers of asphalt pavers, as construction equipment companies focus on procurement of big-ticket projects. Volume sales of asphalt pavers in North America are headed up by the need for maintaining the extensive road infrastructure in the United States. The Fact.MR study estimates that North America will continue to report a bulk of the global asphalt paver demand in 2018. Europe will closely follow North America in terms of volume sales in 2018. The Fact.MR study opines that APEJ will witness a significant revenue increase of 4.9 percent in 2018 over 2017. "Growing emphasis on prolonging the lifespan of existing road and highway infrastructures and increasing public and private investments are major factors fueling the demand for asphalt pavers. As construction companies are vying for low operating costs and higher productivity, the asphalt pavers market has witnessed the introduction of some of the excellent, high-performance models of asphalt pavers in past half a decade," said a senior analyst at Fact.MR. The study finds that tracked pavers will hold more than 73 percent of the market share in 2018 as contractors for asphalt highway and airport pavement projects highly prefer tracked pavers over wheeled pavers. Wheeled pavers continue to register steady demand, however, especially in patch paving applications or paving projects on town or city roads. Demand for hydrostatic screed continues to gain traction among asphalt paver end-users owing to its superior function that provides uniform screed across the road surface. The study estimates the share of asphalt pavers with hydrostatic screed in volume sales will hold at over two-thirds in 2018. Paving width and operating weight are two of the prominent features that according to Fact.MR remain crucial for construction companies in optimizing their investments. The study estimates that owing to their low engine power and economical nature, screeds with paving width ranging from 4.9 to 8.2 ft. are highly sought after and will account for more than 40 percent of total volume sales by the end of 2018. On the back of increasing mega projects across developing economies, Fact.MR predicts that asphalt pavers with paving width of more than 16.4 ft. will register rapid expansion. Asphalt pavers with 17,637 to 26,455 lb. operating weight will remain preferred as this range of operating weight, as per the study, provides cost-effective operations throughout the construction project. Asphalt pavers with 17,637 to 26,455 lb. operating weight will witness moderate growth from 2017 to 2018. 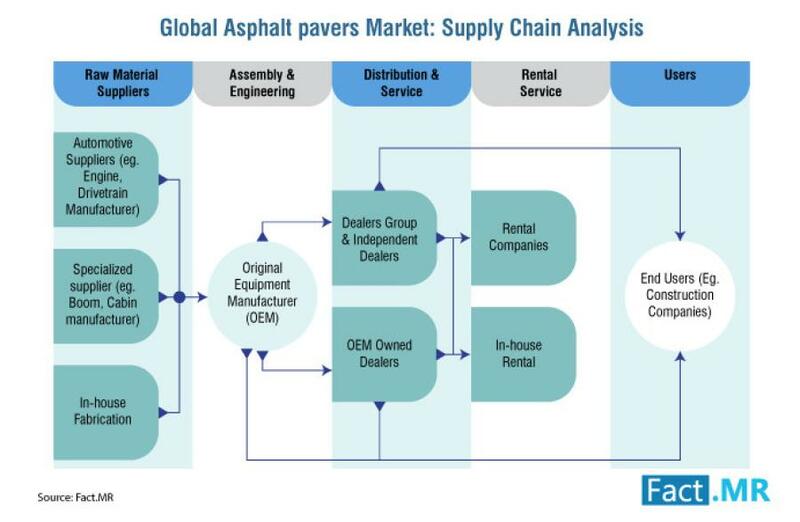 In the consolidated landscape of the construction equipment industry, the asphalt pavers market presents the dominance of a handful of market players. Fact.MR valuation finds that Tier 1 players hold more than 64 percent of the total market share. Procurement of big-ticket projects continues to remain a prominent strategy of Tier 1 companies in the asphalt pavers market. For instance, a construction equipment fleet of more 50 machines from Wirtgen Group is being utilized in the New Istanbul Airport, the world's biggest airport project. Another instance is Dynapac, a fleet of whose machines is being utilized by Kuwait's largest construction company, Galfar Engineering and Contracting, to aid road and infrastructure projects in Kuwait. The Fact.MR report tracks the asphalt pavers market for the period 2018-2028. According to the report, the market is likely to grow at a steady pace and register more than 3 percent CAGR through 2028.